Art music thrives in Korea. The trouble is, you have to go there to realise it. There are Korean musicians in most of the major orchestras of the world, Koreans pop up at all the major music competitions, there are a few Korean stars on the international circuit (violinist Kyung-Wha Chung and soprano Sumi Jo to name just two), and there is at least one major international composer (Unsuk Chin). The Seoul Philharmonic Orchestra under its Korean conductor, Myung-whun Chung has created a presence on the international stage through recordings and occasional tours (as well as, rather less happily recently, through some much-publicised scandal - NY Times article), but otherwise Korea seems pretty much self-contained musically. And that’s not good in a world where classical music needs to broach international borders if it is not just to develop and expand, but to survive. 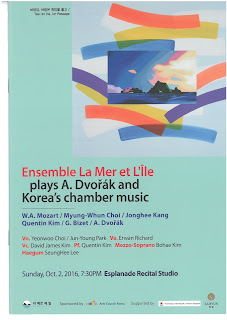 So I welcome the recent creation of an organisation calling itself “La Mer et L’Île” whose policy is “to promote classical music, visual arts and sciences to outside as well as inside of Korea”. What a wonderful idea to promote a land through music and the arts; especially where that land is one which is high in international consciousness through its much less savoury associations with cross-border hostilities. Not that the organisation is totally committed to ignoring political hostilities with South Korea’s neighbours; the group’s French title evokes the remote and rugged volcanic outcrop of Dokdo Island, which is at the centre of a long-running territorial dispute between Korea and Japan. La Mer et L’Île embarks this year on its first international concert tour, travelling to Singapore, Sydney and Hong Kong. The first of those international trips featured just seven performing musicians who combined European repertory with new Korean works. This is a splendid concept revealing, as it does, not just original Korean music, but Korean musicians standing proudly alongside their international counterparts. The five “western” instrument players - pianist Quentin Kim, violinists Yeonwoo Choi, Jun-Young Park, violist Erwan Richard (a Frenchman who has been resident in Korea since 2007) and cellist David James Kim (whose background and training has been in Germany) - may not be the most polished piano quintet around, but their spirited and eager performance of the Dvořák A major Quintet was like a breath of fresh air. Some intonation issues between the violins, a distinctly soloistic quality from the viola (excusable in the Dvořák but nevertheless hinting at a certain lack of integration within the ensemble), a few grumbling notes from the cello and some rather muffled detail in the piano, took the shine off the actual playing, but the energy (not least in a finale which was taken at an absolutely breakneck speed) and robustness of the interpretation superbly underscored the music’s folksy qualities; which is, to judge from the very amiable introductions with which David James Kim had peppered the recital, what the group was aiming for. The Dvořák filled the second half of the concert, while first had begun with the string quartet alone giving an endearing account of one of Mozart’s so-called “Salzburg Symphonies” (no.3). Here was a sense of tight and familiar ensemble which well conveyed the charm and innocence of Mozart’s very youthful writing. The first half ended with a potentially bizarre arrangement of the “Habanera” from Carmen for piano quintet and mezzo-soprano. What transformed this from the bizarre to the deeply impressive was Bohae Kim who, a dominating presence in bright green, used the intimate environment of a stage-less recital room, to stroll amongst the audience, goading them into responding by making eyes and provocative gestures at them, and milking their applause for all she was worth; even to the extent of coming back out to take another round of applause long after the houselights had gone up and the audience members started to file out for the interval. It was great visual entertainment – not least the way the string players interacted with her – but it was also a powerfully musical performance. Ms Kim, possibly singing under her full strength to meet the intimacy of the room, nevertheless brought every ounce of an operatic mezzo’s skill to play to make this, vocally, a most compelling performance. The remainder of the first half was given over the Korean works, and here I was reminded of a comment made by an adjudicator colleague who had suggested that, impressive though Koreans were in competitions, they played safe and never liked to take risks. To hear these three new Korean works – Dokdo, Two Ears by Myung-Whun Choi, Morning of the Ocean by Jonghee Kang and Fantasy-Variations on an Olden Air by the pianist, Quentin Kim, all three composers in their early 40s – you would have thought the neuroses of the 20th century had never impinged on Korean composers. No hint in any of these works of the experimental, challenging and, as often as not, pointedly non-traditional which obsessed the Americans and Europeans in their striving to create something new and distinctive. Choi’s sounded like Debussy and Ravel with a touch of Chilli Sauce, while Kang’s threw a fair sprinkling of raw cili padi into some distinctly Brahmsian ideas. For his part, Kim was happy to bask in the world of Schumann as he set about his comfortable set of variations for piano trio. Comfortable and safe as these works were, they were none-the-less rewarding and deeply satisfying, offering the audience a welcome sense of the vaguely familiar within unquestionably distinctive voices. Perhaps the only one which did not really work was Kang’s trio for violin, cello and Haegum, a traditional Korean instrument much like a mellower version of an erhu. SeungHee Lee was the Haegum player, and much as she worked to integrate with the western instruments, the disparity of tone was just too disturbing. When Lee emerged at the end of the concert to offer an encore with cello and piano in an arrangement of a Korean folk song, things worked much better. Whoever had made the arrangement understood the issue, and while the piano was delicate in its harmonic support, the cello created an almost harp like background for the distinctive and often forceful voice of the Haegum. Sydney (15th October at the Conservatorium) and Hong Kong (27th November at the APA) are in for a treat.